So how does a car drive around in a horizontal circle? Well for a start, friction is needed to keep the car form sliding down the wall. The friction force must be equal to the weight. Friction on the ground is normally a fraction of the normal reaction – here that is still the case, but turned sideways. A friction co-efficent of around 0.8 is good, meaning that the friction force is 80% of the normal reaction. 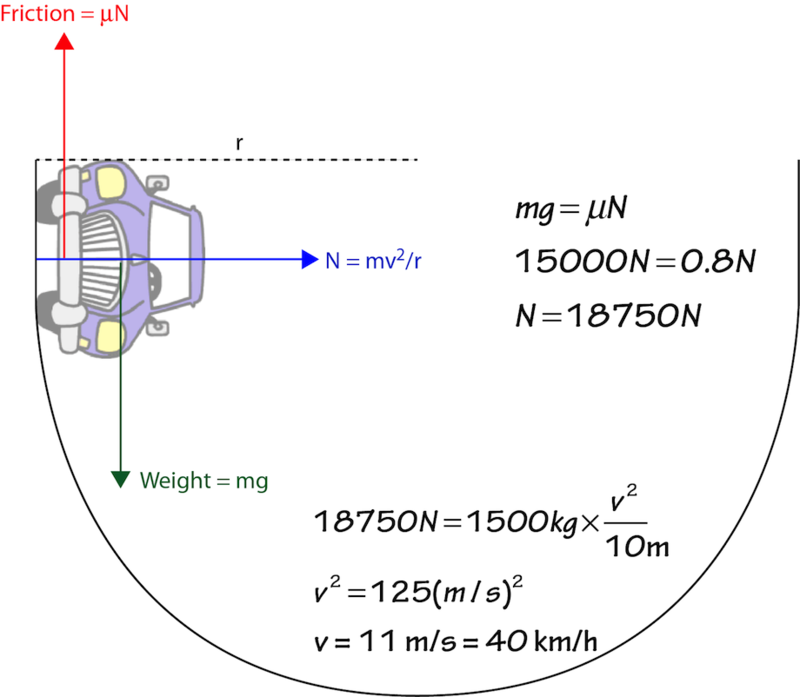 So to find the normal reaction needed to produce 15,000N of friction (equal to the weight of a 1500 kg car), we need to divide by 0.8 to get 18750N. This entry was posted in How fast can things go?, Unit 3, Videos and tagged Circular Motion, Forces, Gravity, Motion, Video. Bookmark the permalink.